Boxing, football, tennis and triathlons are just a few of the sporting events that SLLFX have supplied sound, lighting and special FX for. Sporting events are always full of energy and excitement, its all about the build-up to the main event so making sure that the participants and crowds are fully immersed is key. We’re able to provide exceptional production including lighting, audio, video and staging services for sports events of all types. Special FX including CO2 cannons, pyrotechnics and lasers can also be used to make an impact. Our LED walls are ideal for showcasing messaging, graphics, video and advertising. They can be built to any size or shape including walkthroughs for participants to enter events through! 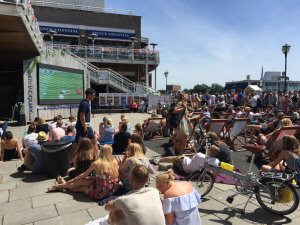 Large-scale sporting events can also be streamed live to your bar, hotel or any other venue using our LED screens, built to requirements; perfect for showing football matches, Formula 1 or other renowned sporting events that will pull a crowd! Whether you need a full production service or a simple stage and PA system, SLLFX can work with you to advise, create and deliver the equipment and team you need to make your event a success. Contact us today.